. However it is dangerous to push her too far. Glockling is able to turn to Fudge for support. 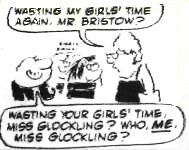 After one such intervention Jones finds Bristow writing out "I hate Miss Glockling of the Typing Pool" 100 times. Jones: Who told you to do that? she confronts the bold typist Miss Dubois, who has used some underhand tricks to offload work onto Jones.